Favorite Treat: Pretzels & retirement! 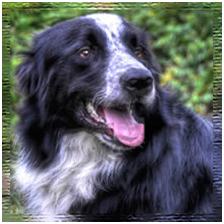 Notes: "I rescued Rocky in November 2009 from a Border Collie Shelter in Michigan where he was surrendered- after a very "Rocky" start to life, being crated from long times, submissively peeing and scared of everyone. When I met him he loved to do one thing - search for his ball! By March 2010 he certified with Kentucky Search Dog Association as a live find area search dog. He took to training so well and everyday showed improvement. Today he is a friendly loving smart dog, he just needed a job and a positive environment to thrive in!"